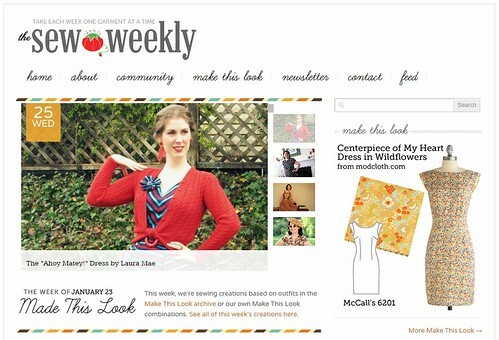 This afternoon I was thrilled to find that my latest creation is featured as today’s Sew Weekly Spotlight! I will have more pictures and information about the construction of this dress, just as soon as I recover from my excitement. "This time she's showcased over at Sew Weekly." "Mmm hmm, she and those heels which match that cardigan she made, which match the belt buckle, earings, and the ribbon in her hair." "Yes, and the lipstick too." "How can someone break the rules with horizontal stripes, and score a grand slam? Smart look, even more of a nipped waist, all for less than $33, and what knocks it out of the park is that the cloth came from JoAnn Fabrics. JoAnn Fabrics!" "She's not morally reprehensible, she's SARTORIALLY REPREHENSIBLE!" "I'll say, and she already owned the pattern, don'tchaknow." "That and a "one hand on hip, one hand on shoulder" pose, which is the equivalent of a twirl while standing still." "With her it's every trick in the book; first edition, mind you."